Aircraft - Electric - Multirotor Drones Mini Multirotor Drones Idea RotorX RX155 Micro Brushless FPV Hexacopter "Raiju"
RotorX RX155 Micro Brushless FPV Hexacopter "Raiju"
Because. Because a micro 155mm brushless hex would be almost as good as bacon. And that's about it. Oh, and probably a micro brushless quad around 118mm too. 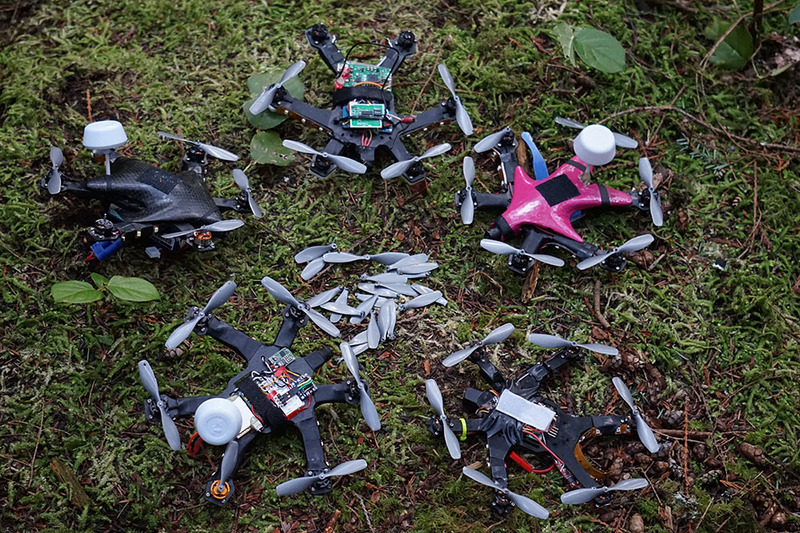 So RotorX created Raiju (said micro hex) and a yet unnamed micro quad for everyone's racing enjoyment. Combine a team (RotorX) of pilots, designers, entrepreneurs, and a designated safety officer with a drive to create something this cool (rub a bit of bacon grease on the canopy to make it go even faster) and it is became a reality. Combine that with the ability to design, create, and source custom components and you get one powerful beast. Well, WHAT are the specs then? All the carbon fiber goodness with a custom powerful drivetrain and you get a bird that weighs in at just under 200g but has the punch of almost 700g. Stick a micro FPV system on there with full OSD and an HD camera, and buzz your cat/dog/unfortunate humanoid for everyone else's enjoyment. Custom 1104 motors with custom props (no press fit for these folk), new ESCs and 3S powa gives some good hover times (/boring) and superior race potential (/that's better). You'll have to wait for more info though, there's a lot being brewed up. Soon(ish). We are currently beta stage testing with about 10 prototypes in the hangar. Aiming for an early March release. WHO can show me this guy?? Keep up with new release info here on this thread, but also on the Facebook and Instagram. Lots of good pictures and video posted there that's not here. WHERE are you flying them? Top secret location. Think indoor paintball course in Vancouver. Such as in these videos. NOTE that pictures and videos are with prototypes which may or may not have the new hottest tech on board. We are constantly trying to squeeze as much as we can out of every aspect of this model, and this means a lot of iterating. Questions or comments welcome, and probably a lot more info will be posted on this thread in the near future. Last edited by MayMayDay; Jul 28, 2015 at 08:24 PM. Wow! Between this yummy looking new design, and the exciting new Morphites, the month March is going to be pretty expensive for me. Hurry, so we can reward such ingenuity. Looks very nice. Any pics off the unamed quad? looks great, any pricing info ? Pretty cool, I have to admit. Got one I'm developing myself, but it's just a custom one-off for personal use. This thing looks awesome, though. Are the electonics a "all in one" home made solution ? Would love a picture with no cover on so we could see it loaded with electronics. are the motors off the shelf or made for you? Looks freaking fantastic! is it wrong if this makes me horney? nice work guys. cant wait to see more. looks like my tax money will find a new home in Canada.